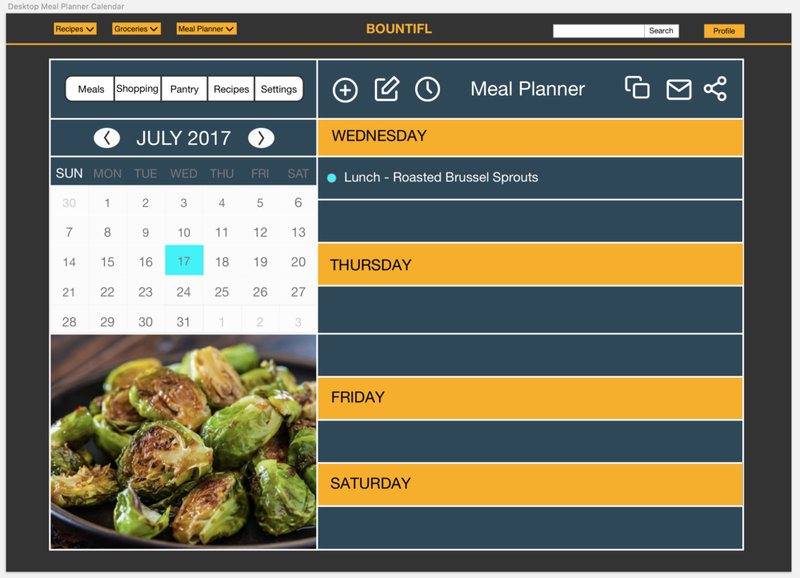 BOUNTIFL was an experimental and expanded upon idea of creating a customizable website that would better cater to the needs of users that needed highly customizable recipes. Starting with the first version of the app (later to be expanded to responsive design) we look into the core desires of what our targeted user needs. One key item that had to be cut from both the way to implement it and complexity was the container size. Since the app would pull recipes from the web and translate the ingredients into a more mobile friendly format, no such format (from what could be found on the web) standardizes any type of container system. Which in turn would need much more resources than what was available to do on a project of such a small scale. With such a large task for a small amount of time, constructing the app took more thought and with multiple iterations, a more focused approach needed to take place next. One other consideration arose during this stage as well, if recipes could be tailored with what the user wants in them, could recipes be searched for with select items on hand as well? 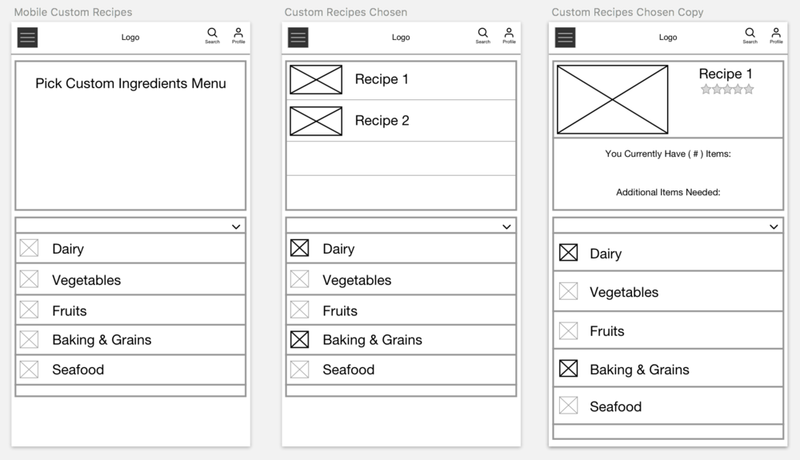 With the dual function of the website in mind now, creating these new wireframes was an easier task. And with responsive design in mind, expanding the frame and filling the excess with whitespace helped with the overall design. As mockups were being formed, color and a meal planner was being added as well, if you have the ability to add more functionality, why not? Though, the thing about this project was it lacked a few key components: oversight, more human feedback and most of all, too much ambition. After initial review of the website, even though parts were very well laid out and well received, there were some glaring flaws with how complex the site became. Design tends to cater to the simplistic, too much context in one space will confuse and frustrate users, leading to no use at all. While the vision had good intentions with combining aspects of other similar websites, you have to look back and see why they chose to focus on single things. In truth, the website had too many elements going on and had to be scrapped. Going on pure intuition alone does not substitute pure human feedback. There were times where you had hoped you were looking out for your future users and making their lives easier with a deep insight to the creation of your work. Also, UX work solo is incredibly tough and there were elements that slipped by my sight, prime piece of which was too many elements that became redundant during the design process. In the end, its a good look back on how important our users are in any project. Users are how and why we as UX Designers exist and paying attention to them is what will make or break our designs. Lots of lessons to be kept for the future in both ways to move forward after failure and how to remember the past.